After the 1st qualifying race at Woodhill one of the volunteers came up to me and introduced herself - and it turned out she was a blog reader! How cool is that! In all the excitement I forgot to ask how she originally found the blog, but she said she liked it because she had similar interests and a similar sense of humor. Amazingly, Valerie is also into all manner of projects, and like me, she will also attempt projects she's wildly unqualified to do. Also she had come all the way out from the States (Washington) to assist with the results software for this event - something I also like to tinker with! Anyway - it was very cool to meet her, and I really appreciated hearing there was someone who enjoyed reading my blog! Thanks for introducing yourself Valerie! For the first time since the very early days of our trip, we awoke to the sound of rain on the roof. We’ve been incredibly lucky with the good weather generally, so suffering through a day of rain wasn’t going to be the end of the earth. Clare, Paul and I had early starts, so we were out at the event first. 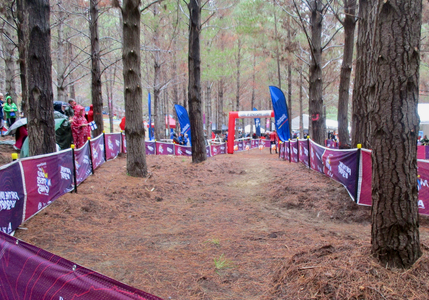 The arena setup looked really good again, set in the pine forest with great vantage points of the finish chute and a fantastic atmosphere. The terrain was incredibly cool - fast open running around soft (but not sandy) dunes, then into horrible thick stuff with low visibility. It was the thicker stuff that turned out to be my undoing, as I was having trouble with my vision anyway - with water all over the outside of my glasses and the fog on the inside of my glasses completely obscurring my view of both the map and the terrain - it was particularly bad in the thicker areas and I made mistakes that forced me to relocate off nearby tracks. It was shortly after that point that I was caught up by some runners on my course who had started a bit behind me (thus were ranked higher), so I decided that in light of my vision problems, my best bet was to try and stick with them - so I spent the next 5 or 6 controls running along behind them, keeping a vague idea of where we were. This worked well until they disappeared from view for a moment in another section of thicker vegetation and suddenly they were gone. Luckily I was still with a Swiss runner (Jeanette) I’d caught up to at about the 2nd control who had also lost the pack, so we were running together as we did the last few controls - my vision was so bad by the end I almost missed a compulsory taped road crossing (I couldn’t see it on the map OR in the terrain!) but by then we had silently established a rapport, so, breaking silent-mode, she said ‘hey! over here!’ as she ducked through it, which saved me from further lost time! The combination of early and late mistakes but with some fast running in the middle section meant that I finished a respectable 9th. Clare didn’t have the luxury of a pack to run with and also made a few of her own mistakes, so she finished in 8th, 2 seconds ahead of me. The technical terrain caused lots of people to have mistake ridden races, Jon finished 21st, Paul had a great first half but might have cooked his goose too early as he faded a bit in the 2nd half and finished 23rd, Andy was just behind him. Harald lost a few minutes here and there and finished 4th, and Linda unfortunately fell and broke her compass on her way to the 2nd control, which made it very hard to navigate through the sandhills but she still managed to finish just 7 seconds away from 3rd. Andy was pretty happy with his run. The rain stopped after a few hours which was also good - particularly for the kids who just had to wait around as they don’t have any junior races. They spent a long time building a rain shelter from forest wood which was a good distraction. And so ends the orienteering part of our trip. 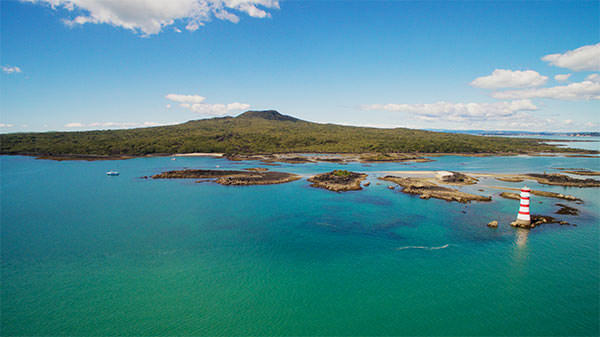 Being able to stay with Kim and Helen in Auckland for the first few races and then having such a lovely place to stay in Murawai just topped off our holiday perfectly. 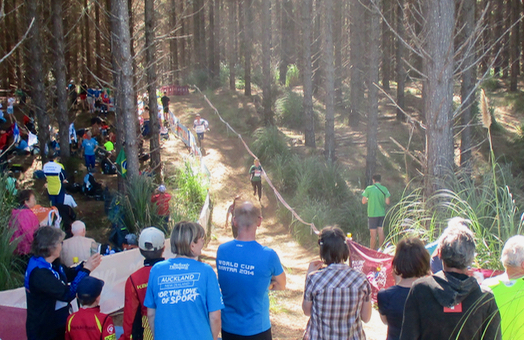 I really enjoyed all the sprint races - despite my mispunch at Rotorua. 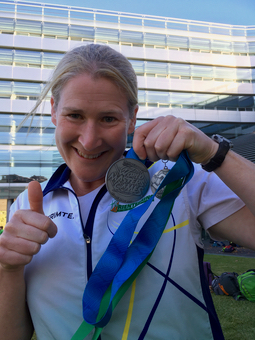 Winning a medal was obviously a massive highlight - it will undoubtably be the one of the highlights of my lifetime of orienteering (my others so far are JWOC 1990, coming 3rd in Elites at the easter 3 day in 1997, and winning a pair of Blundstone Boots at a race in Hobart once :) ). 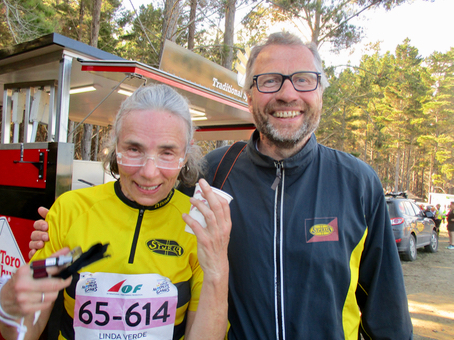 Speaking of a lifetime of orienteering it has been very cool to see all the real oldies competing out in the forest. There was some great commentary as a finish chute sprint unfolded between two 90 year olds which got a great reception from the spectators. I love this sport! 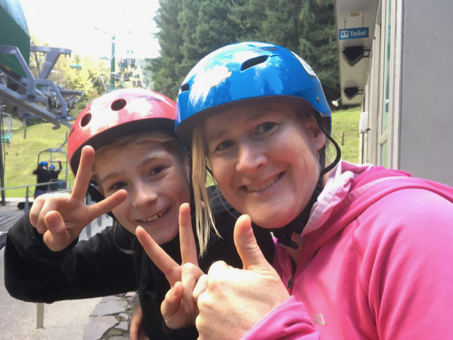 It was a shame there were no races for the kids though - Zali and Jett both enjoyed the races they did before the World Masters and were keen to do more. 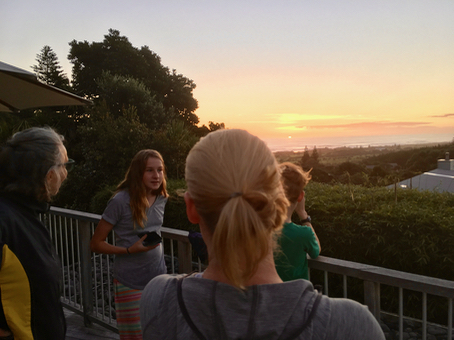 So with a fair bit of sadness we said goodbye to our excellent Sydney and Norwegian friends and headed back to Auckland, where our spirits were instantly lifted by a lovely family dinner at Kim and Helen’s with Don and Helen Snr. Being the bestest hosts ever, Kim helped us return the hire car last night and drove us to the airport at 4am (yes 4am!) this morning, saving us a large amount of stuffing around this morning. We’re lucky to have such a good family! What a fantastic adventure this last month has been. 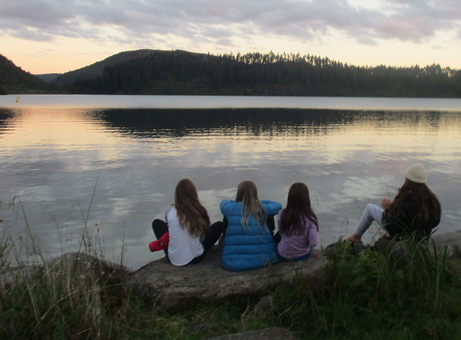 Campervanning, hiking, Rotorua, hanging out with family, orienteering. It’s been just brilliant. Jon certainly didn’t get much rest overnight as he stayed up until 5am to try to restore data on his servers (which amongst other things, host this blog). They had been hacked by ‘ransom hackers’ - people who encrypt everything and will only undo the damage if you pay them. Luckily Jon had backups and was able to get everything up and running again this afternoon. He’s a genius. 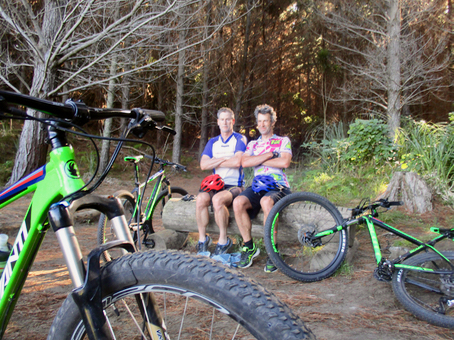 While Jon recovered from his late night, Andy, Paul and I went to Woodhill to go for a fun mountain bike ride. We tried to take it pretty easy so we didn’t trash ourselves before tomorrow’s final, but we did still have to climb up a few hills so that we could enjoy some swishy downhills. 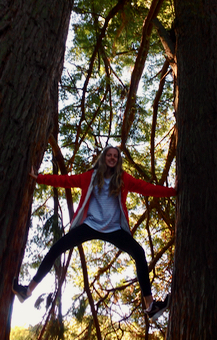 There was a conveniently positioned viewpoint for photos at the top of one of the largest climbs. Andy and Paul were certain that posing like they were in a soccer team would be hilarious - I’m not convinced :) ! Andy found his favourite trail of the day.. 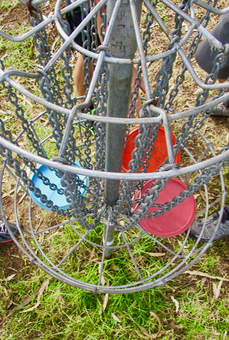 Afterwards Jon and the kids drove out and met us for some super fun frisbee golf at the same place. It was quite a tussle but Andy ended up walking away with the win. 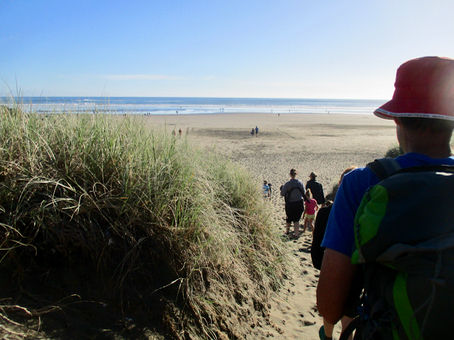 Following lunch back at home we headed to the beach for our last rest activity - a swim in the surf. 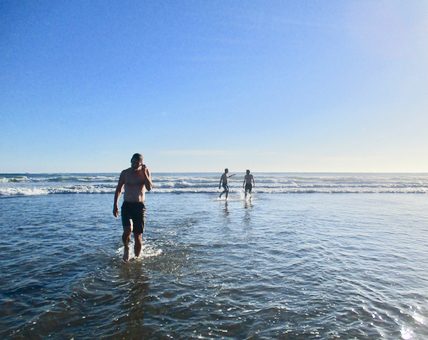 It’s amazing to think we’re swimming in the sea at the end of April - the water temperature is pretty good and the beach is lovely. 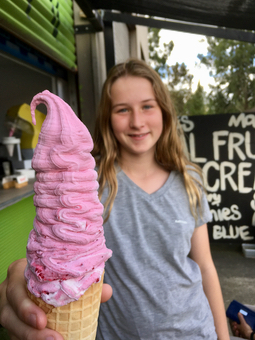 The highlight of this day was the giant ice creams we got from the local fruit and veggie store. At $4.50 they were a NZ bargain! In other news, I had a good run and finished 8th, securing myself a seeded bib (10) for the A-final on Saturday, and also achieving my overall goal of qualifying for both the sprint and long finals - YAYYY!!!! The other cool news is that Jon, Andy, Clare, Paul and pretty much everyone else we know have also qualified for A finals and Harald and Linda were both 1st in their qualifying, putting them as the hot seeds for the final. Woohoo! We finished the day with a nice BBQ on our lovely deck, watching the sun go down over the sea. Another beautiful blue sky day greeted us this morning from the balcony of our lovely house at Murawai (sorry - still need photos of that!). We had relatively short drive out to the event today, but then a very long walk to the assembly area (2kms). 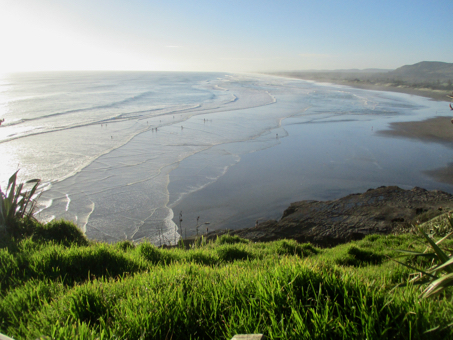 I took a few photos as we trudged back to the car at the end of the event. There would have been quite a few classes (the W70, W75 etc) for whom the walk to the assembly area would have been longer than the distance of their course! I tried to take some more photos of the orienteering area today - it was really nice under the pine trees (when we finally got there!). 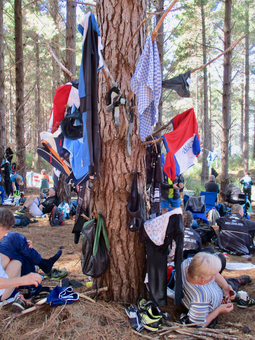 Clare getting ready to run, and a tree decorated with stinky orienteering gear afterwards (note also someone is getting changed at the left). 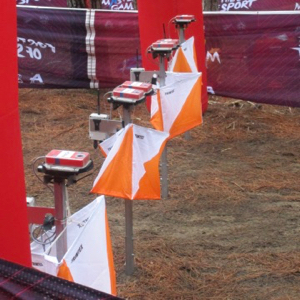 The World Masters Orienteering Championships has 2 qualifying races for the final of the long event - you need to finish in the top half of the field with your total time to go through. I had a slow and messy run today so I am currently sitting in 15th spot (I need to stay above 22nd). Clare had a great run to finish second, Jon & Paul are sitting comfortably at 10th and 12th respectively, and Andy is sitting right on the cut off point at 27th out of 54 runners in his heat. Hopefully we all make it through tomorrow. 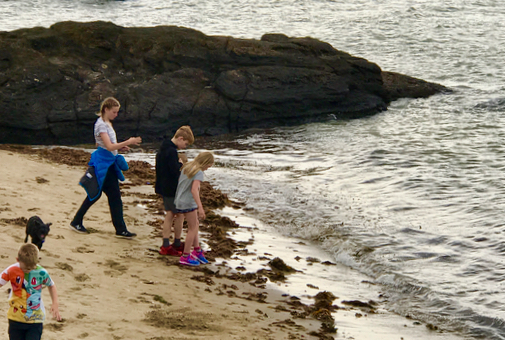 After the orienteering we picked up the kids (who had spent the day relaxing, reading, watching tv, and in Zali's case, researching cruises we could all take), went down to the beach for a swim, some frisbee throwing, and to check out the gannet colony living on the rocks. 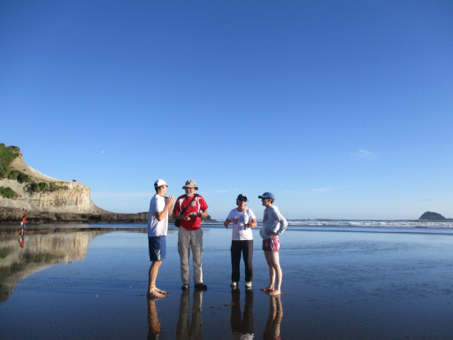 The beach was filled with nattering orienteers, and also a Russian soccer team who must have had a day off. Then it was back to the house for a dinner of leftovers and chocolate. This house also has unlimited wifi, which is how I've managed to continue with prompt blog posts! 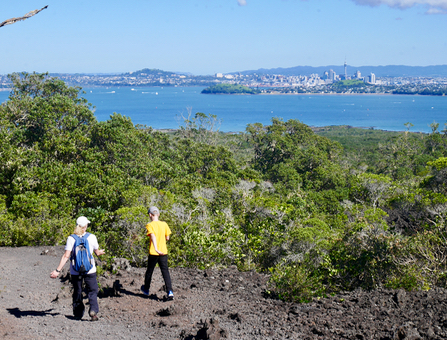 Our excellent hosts and tour guides Kim and Helen came up with the idea for us to spend the morning on the relatively newly created Rangitoto Island (it emerged from the sea after a volcanic eruption 600 years ago) before heading up to Murawai for the model event today. Luckily Kim was alert to the fact that it would be a popular day for the ferry to the island, so he headed into the city early to queue for us all so we could get on the boat (it’s a bit dumb, but having a ticket for the 20 minute ferry trip doesn’t actually guarantee you a spot on the ferry). It was a beautiful day for a trip on the harbour - there were heaps of sailing boats and great views in all directions. 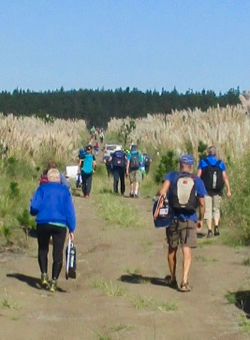 We disembarked at Rangitota and headed up to the highest point on the island - a 2.4km hike. 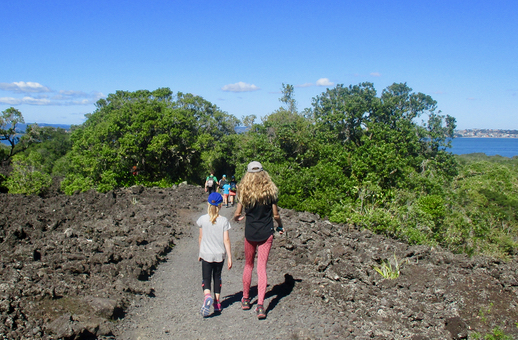 The path went past barren lava fields and through relatively newly wooded forests as it wound its way up to the volcanic crater where the views were pretty cool. On the way up we checked out some Lava Caves and crawled through them, emerging through a shaft some 50 metres away. It was super fun. We still had to get to the model event for the long races so we had to scoot back down the hill to catch the 12:45 ferry back to the mainland. 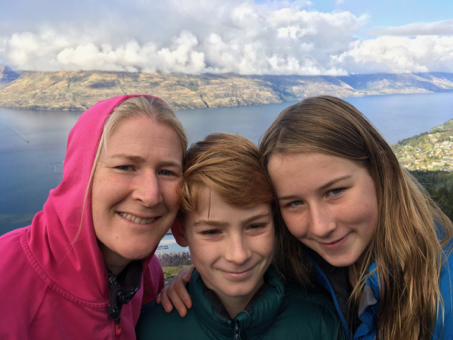 It turned out that this walk (of 5 or so kms) was six year old Jack's new record for hiking - which was a pretty good effort as half of it was uphill ! He had no trouble with it at all (nor did Ava, who spent a lot of time walking and nattering with Zali). Tonight and for the next 3 nights we’re staying in a rented house in Murawai - it has a lovely deck and views out to sea. After checking out the area which will be similar to where we are running tomorrow we had dinner with Clare, Andy and Paul, then drove around to Harald and Linda's to teach them how to play bananagrams. As it's a similar game to scrabble it's hard to play it if you aren't English, so we eventually settled on a system whereupon they could use either Norwegian or English words, and each of our racks had to include two Norwegian words.That certainly evened up the competition - we had to stop playing before we got beaten! Today was the sprint final. I wasn't particularly nervous, as I'd already achieved my goal of making the A final, I was really just looking forward to racing as I enjoyed it so much yeterday. 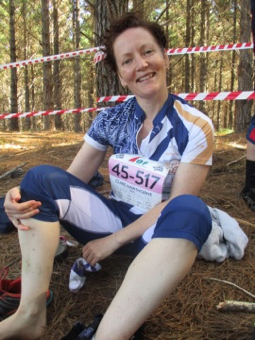 The starts were in reverse finishing order - so I started 5th last, the winner of the qualification started last and Clare (who was third in the qualifying) was a couple of minutes behind me. 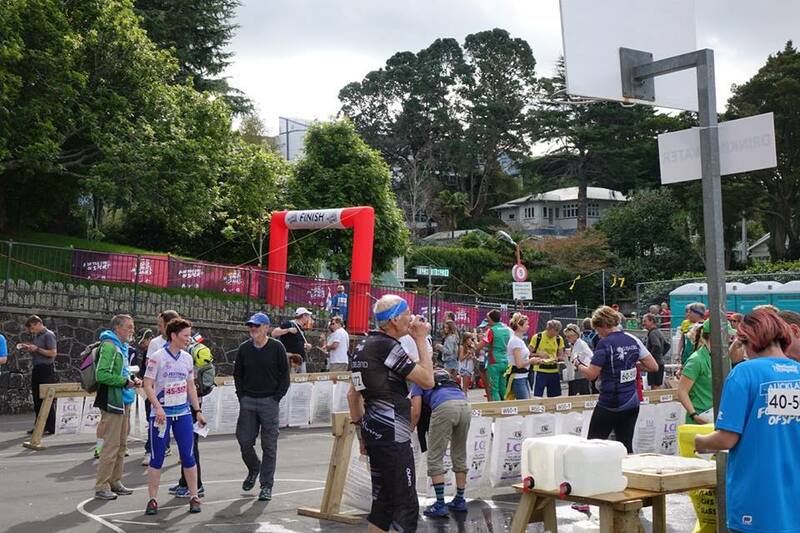 The first third of the course was fairly fast and easy through a park with fountains and controls on trees, then we entered the campus of the University of Auckland where it got a lot trickier (but not as tricky as yesterday). From looking at the split times I can see that I was equal third (with Clare) at the halfway point, but then we had a leg which used an underpass and all but 3 in my field made a mistake exiting the tunnel and thinking we were somewhere else. 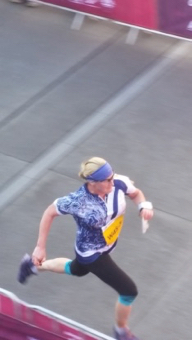 I was lucky to work out what was going on fairly quickly and only lose a minute before finding the control, but unfortunately Clare lost 3.5 minutes on this leg which pretty much blew her race out of the water. The rest of the course had a few tricky legs so I was pleased to get through it pretty smoothly and the splits show that I jumped up a place in this latter part of the race. I was hoping for a top 10 finish, and repeating my 5th from the day before would have been extra awesome. So to hear myself announced as leading the course when I punched the finish was really cool (as that meant I couldn’t be worse than 5th when the top 4 behind me finished!). 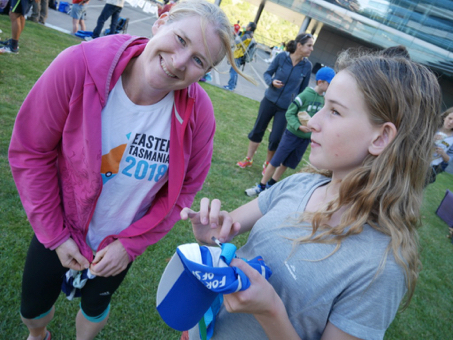 As I hung around at the finish waiting for Clare I noticed that it was over a minute before anyone did actually come in behind me, and in fact the first person I saw was Natasha Key, the eventual winner who is super fit and fast and runs for Australia in elites. She’d overtaken positions 2-4 on her way around. So I finished 2nd! So exciting! 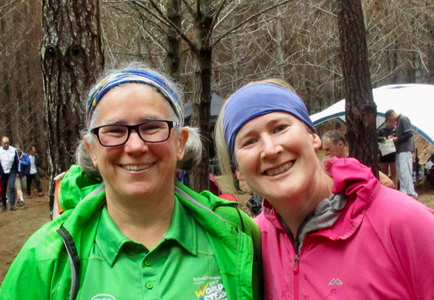 It was extra cool to have Kim, Helen, Jack and Ava there as well - I’m glad I was able to make spectating orienteering a bit more exciting (even if that did mean we all had to wait around for the presentations at the end). Someone offered to lend me an Australian Team jacket for the presentations which was great as I felt like a prize chump standing around in my hot pink kathmandu hoodie while everyone around me was in their full country uniforms (I don't have one as I'm not on the Australian Team for Oceania). Jon had a solid run to finish midfield in the A final & Paul finished a minute ahead of his B-final compatriots. Today was the first day of competition for us in the World Masters Games. 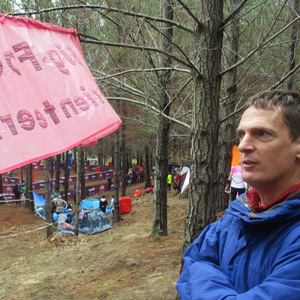 This is the first ‘World’ orienteering event I’ve done since the World Junior Championships in 1990. 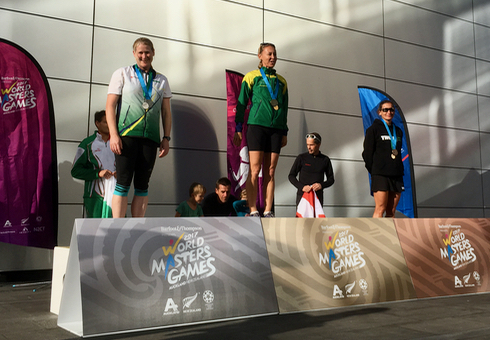 Of course in 1990 you had to be part of the Australian team to compete, whereas anyone can enter the Masters Games. 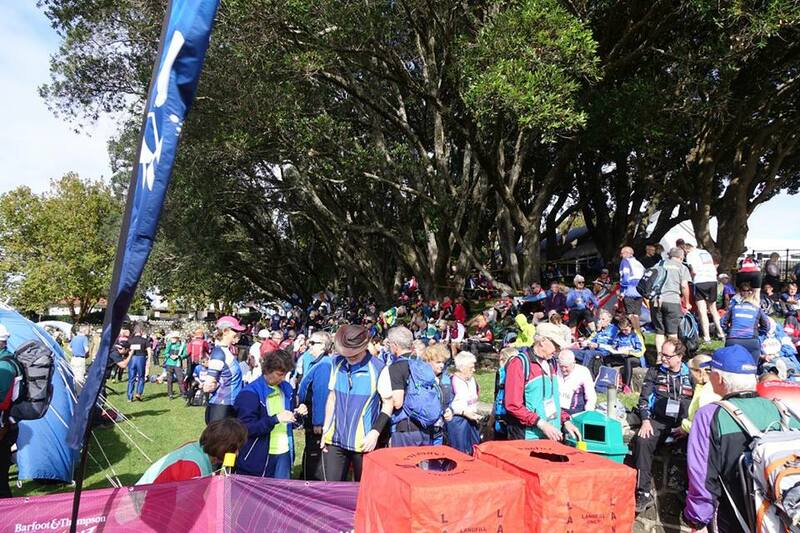 Orienteering usually has the largest or second largest number of participants at World Masters Games - it’s strange to be in a majority for a change! 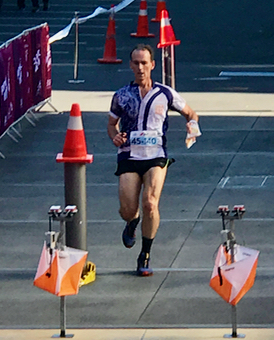 The total number of Masters Games participants here in Auckland is around 26,000, which includes 1,750 orienteers from 40 countries. 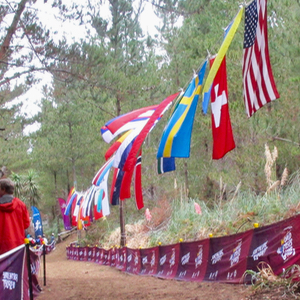 Sweden has sent the biggest contingent of orienteers with 352. Australia has 205. Anyway - today was the sprint qualification. 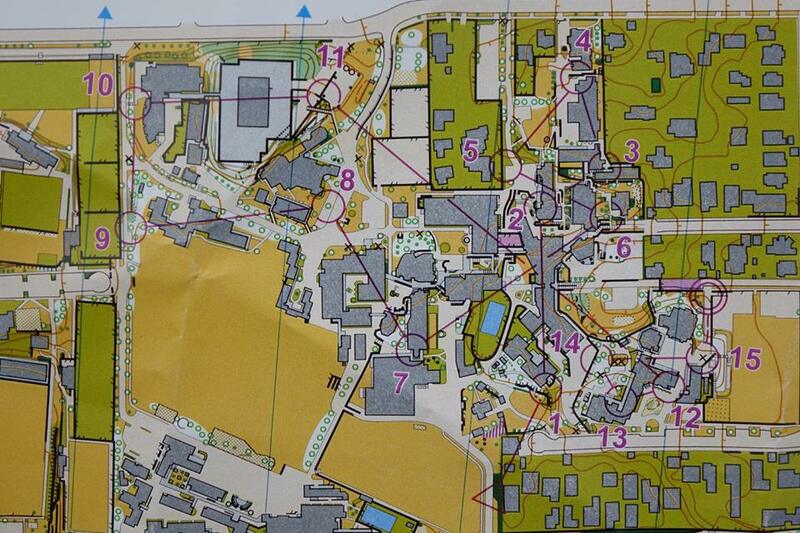 The idea is to finish in the top half (top 20 or so) your heat, so that you go through to the A final tomorrow. Those who don’t get relegated to the B final. 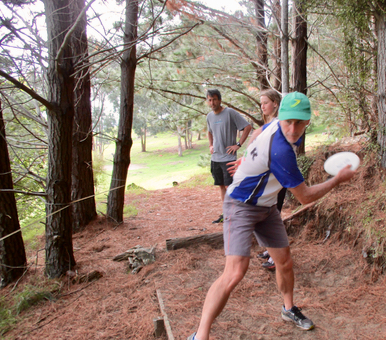 The good news is that Jon and I (and almost all our friends) qualified, the bad news is that Paul had a good run, but unfortunately missed a control just like I did at Rotorua so he was disqualified - ouch. Clare had a good run to be 3rd in my class and would have to be considered in with a chance for a medal tomorrow (as are both Linda and Harald). I was 5th and happy with my run but realistically I’m not in the same class as the top 3 or 4 - I’m just happy I qualified as now that my class is filled with Swedes and Finns I was a bit concerned I wouldn’t make it though. so yay! The area was really detailed and tricky - there were no easy routes so the slower runners - better navigators were on a slightly more even footing than they normally on in Sprint. 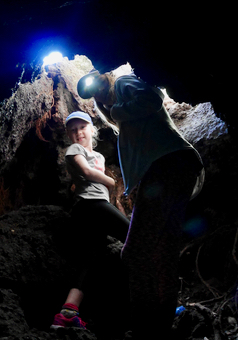 While we were at the event the kids were hanging with the cousins and got to go with Helen and Kim to explore the tunnels at North Head Battery. 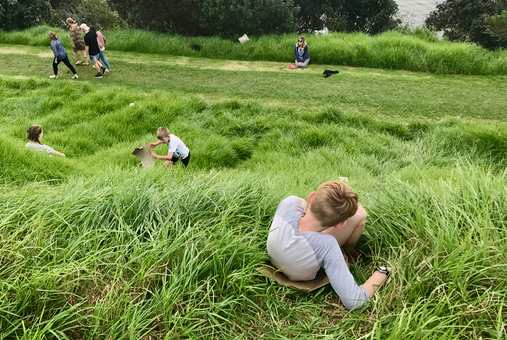 They also participated in a NZ activity called Grass-Sledding whereupon you sit on a piece of cardboard and slide down long grass, losing your cardboard early on and tumbling down the rest of the hill. 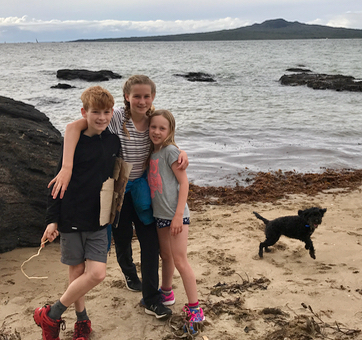 Surprisingly they survived this and we met them after the event at Takapuna Beach for some frisbee throwing and dog walking. 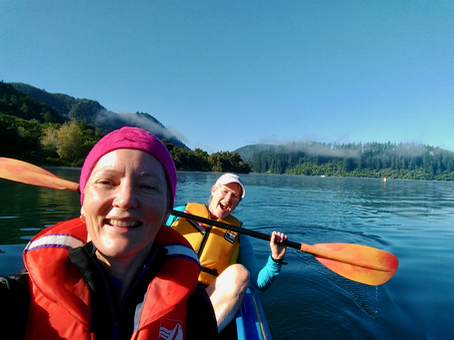 Our last morning in Rotorua started nicely for me with a paddle on the lake with Clare while Jon dealt with the last of the packing up. Out of interest, next time I might book a slightly larger hire car, as this is what the corolla looks like after we've offloaded bags and chairs into two other cars.. Anyway - after final packing we took a small driving tour through Rotorua central - it looked really nice and busy on a sunny Saturday morning. We also drove past the area we'd had the sprint race a few days earlier. 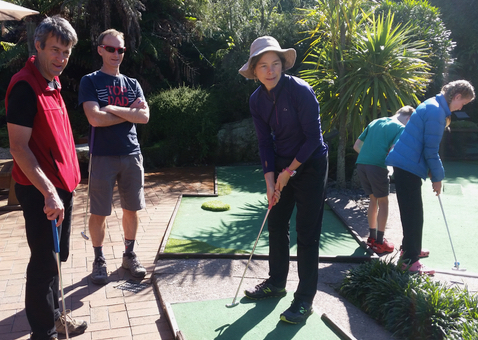 I took a photo of the picture-card perfect croquet ground for mum..
Then it was on to our second last Rotorua activity - mini golf with rabbits. yep. you heard me. 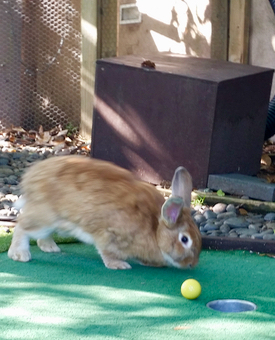 Mini Golf, with RABBITS. We played 18 holes on a regular (actually pretty average) mini-golf course, surrounded by 9 large and roaming bunny rabbits who lived there. It was hilarious - particularly when one took a liking to Jett's ball. You were allowed to pat them, but not pick them up - but they were so large it would have taken a fork lift truck to pick them up anyway! 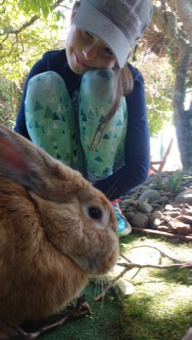 I was very distracted by the rabbits, and consequently didn't play my best. I shot 51, Jon won with 37. 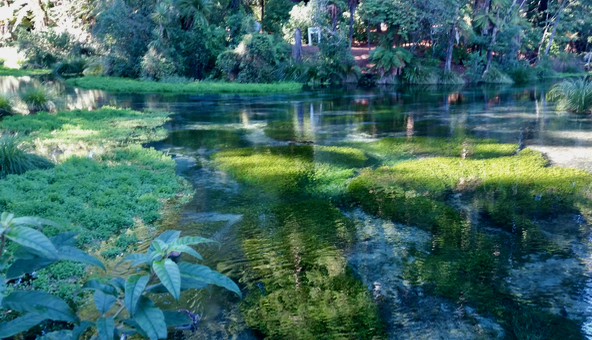 Then it was on to our final Rotorua attraction and something I'd been wanting to see since we got there - Hamurana Springs. 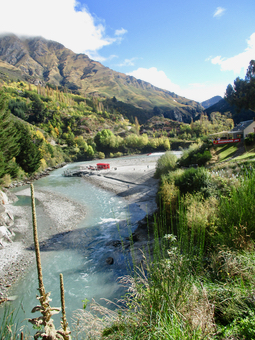 It's a small nature trail surrounding an amazingly clear creek flowing from springs where the ice cold water bubbles up at the end of its 70 year journey from the mountains. The pictures don't do it justice. 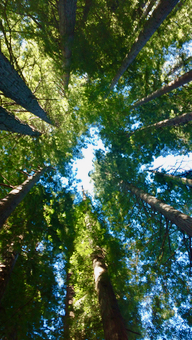 The walk was surrounded by big sequoia trees which made it all the more pleasant..
Then it was back into the car for the 3 hour drive to Auckland to register for the Masters Games followed by a lovely dinner with Helen, Kim, Jack, Ava and Paul, who also arrived today. 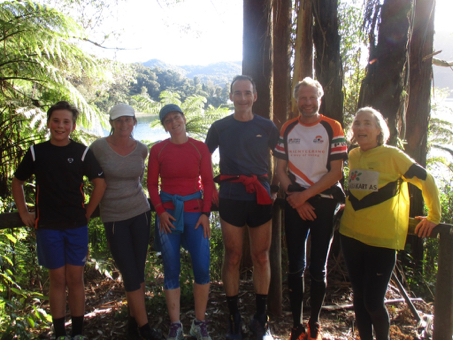 After another lovely morning run around the lake (this time with Harald and Linda who slept through the last session), some of us we headed into town to go mountain biking. 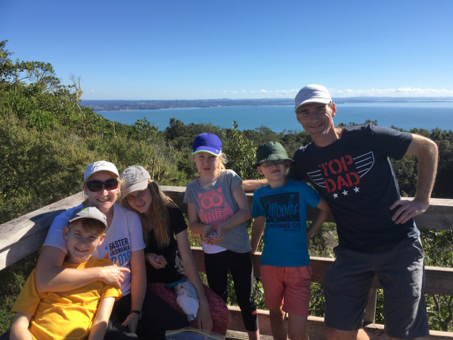 While Jon, Andy, Alexa, Clare, Jo, Leo, Annabelle and I rode, Zali, Lyra and Jett went off to do historical and cultural learning with Paul and Tracy’s family. I’d been looking forward to riding for ages, but I sort of forgot how tough steep pinches and uphill riding is when you haven’t ridden for months - even if you are fairly fit otherwise! Jon and I rode together with one map between us - which Jon held on to as he could actually read the small writing - I just followed along. 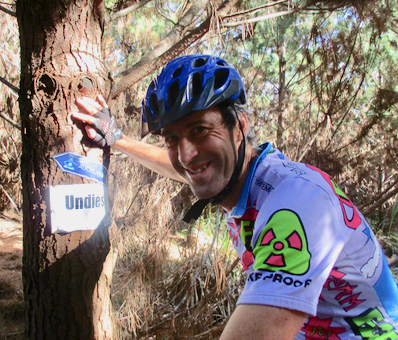 Our plan was to ride mostly outwards and upwards for around 90 minutes, then turn around and take advantage of the mostly downhill riding on the way back. 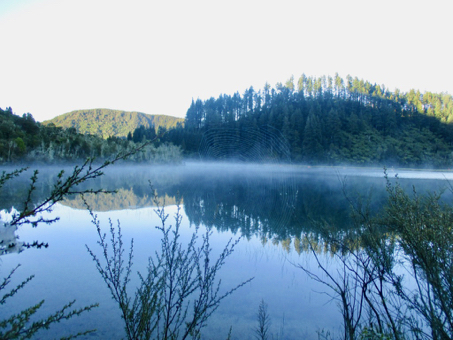 The Redwoods area in Rotorua is made up of heaps of shortish trails (1-5kms) linked by forestry roads, so it takes a fair bit of map reading to get yourself around - also to add to the complications, most of the trails can only be ridden in one direction. I should also mention that Jon didn’t have his mobile with him but we were planning to ride together so it wasn’t worth him driving 30 minutes to go and get it. You can probably see where I”m going with this :) Everything was fine for the first 90 minutes - I was starting to get pretty tired so we stopped for a break. When we got going again we just had few more trails to do before we hit our turnaround point. Just as we started down the 2nd last one, I noticed it was marked as an advanced trail - and since I had struggled a little with some of the harder intermediate stuff, I immediately bailed out and told Jon I’d meet him at the end of the trail where it popped out into the road - less than a kilometre away. We hastily agreed that to do this I’d just continue down the road we’d just left. Easy. So I pedalled down the road but the scenery didn’t make sense with what I’d seen on the map the last time I had looked over Jon’s shoulder. After a few minutes I stopped and decided to ride back up the road to the last map board I’d seen just to check. Sure enough I needed to take a different road to meet Jon. I wasn’t sure if Jon would realise that, so I high tailed it out to where the track actually would come out. But he wasn’t there. I waited around for a while, and called out his name but then I started to worry that as it had taken me a while to get to the right spot, that he’d maybe waited for me, then gone on ahead to wait at the end of the 2nd trail. So I took the 2nd trail and popped out 5 minutes later at a big forestry intersection in what felt like the middle of no-where. And there was no Jon either. Dang! I waited there for 15 or so minutes. At this stage I had two problems - firstly, I couldn’t call him as he didn’t have his phone - I realised there was a chance he had noticed that I had gone down the wrong road and followed me down, or, he hadn’t noticed and had ridden on and I’d missed him. He could be anywhere. 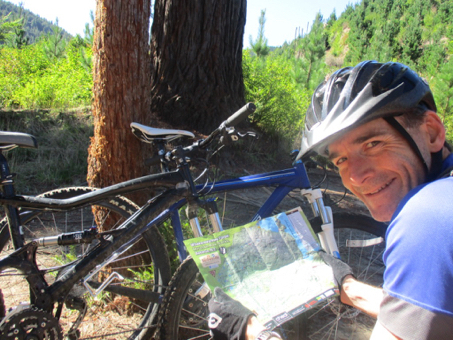 My other major problem was that I didn’t have a map, and I couldn’t find one online from my phone as they sell copies to raise funds for trail maintenance and keep them off the web. There were also no signboards where I was. So I was lost. Double dang. After waiting for a long time I called Clare and she consulted her copy of the map and directed me onto a trail that would head partway towards home. About five minutes later she rang me to report that she’d found Jon, and that he HAD realised our first mistake (actually our first mistake was splitting up, our second mistake was sending me down the wrong road), and he’d gone off to look for me, but I’d realised the mistake earlier and fixed it so we missed each other. The upshot was that he was now back at the start of the trails, and I was miles away, without a map. I followed a few trails that I knew would go vaguely in the right direction, then I accidentally took a longish detour through a submerged and muddy track and emerged onto a road with absolutely no idea of which way to go and pretty exhausted and fed up wiht the whole experience. Luckily I still had my life-line, so after another call to Clare, I was on track again and finally heading back to the bike hire place, where Jon and Andy had been waiting a while. Uff. Always take a phone kids. And a map. Once we were home and recovered we headed back down to the lake for a lovely BBQ dinner with everyone who has been staying here. It’s been a fantastic week and it will be sad to leave. Luckily there’s heaps more of this trip to look forward to. 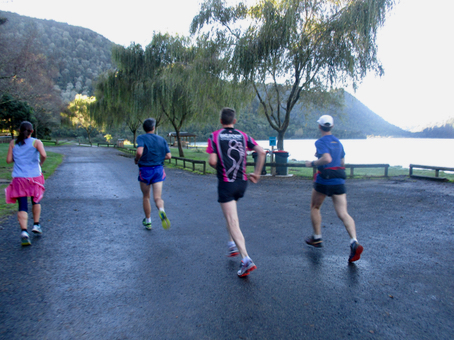 Today was another fun day - first we had the sprint event around the Government Gardens beside Lake Rotorua. 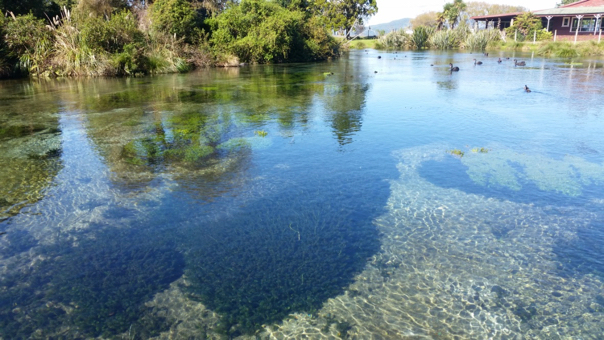 Mostly 'beside', but also a bit actually 'in' Lake Rotorua - as the 445mm of rain that Rotorua has received in the last 30 days has meant that some control features originally at the edge of the lake were now islands in the lake! 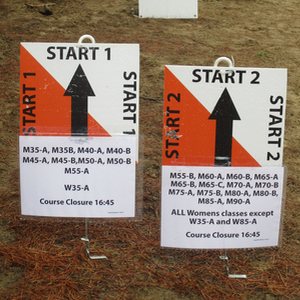 The organisers had to change some of the courses at the last minute, then as a final headache on the morning of the event (i.e. today) they discovered that a) a circus had arrived and set up in the middle of the map, and b) new hot springs had appeared where a control site was supposed to be. Ha! Despite it being very wet underfoot, we all had good runs - Jon won M45, Jett was 3rd in M12, Zali had a good run in the relay event she was in for high school kids, and I had a great run in my class only to discover to my horror (as I downloaded) that I actually missed a control and was disqualified - dang! Still - it was super fun and I enjoyed it heaps. 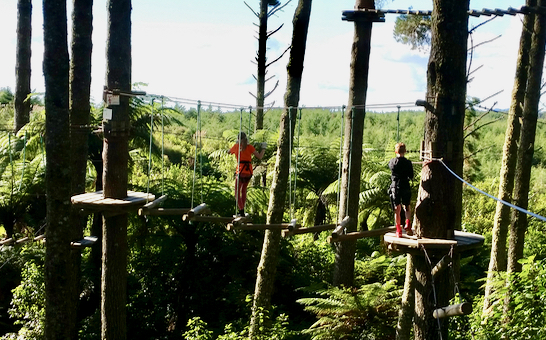 In the afternoon we headed to Adrenaline Forest - something we'd been looking forward to since we were last in NZ. 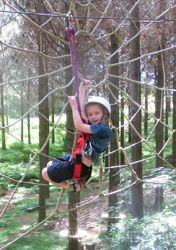 Out of interest, last time we did it (2012) the kids looked like this.. 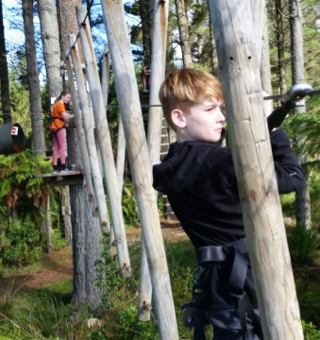 The forest had 6 different courses - each one was harder and higher up than the previous one. 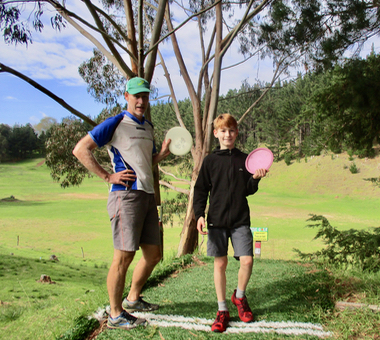 Last time we did it Jett was limited by his height and could only do a few courses, while Zali was technically able to do most of them but I think we only had time for 3. 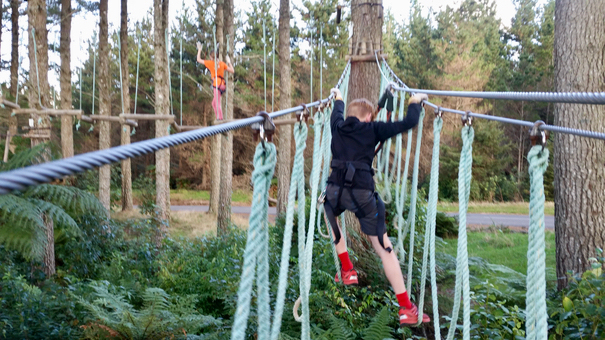 This time the kids were allowed to do them all and only the limiting factor was themselves. 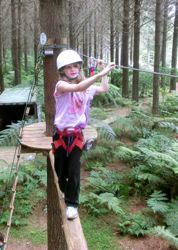 Zali reached her limit walking across swinging logs suspended 25-30m up in the trees, halfway through the 5th course, but did well to finish it. Jett was still happy to continue but by then everyone else (Andy, Lyra, Leo Annabelle, and especially Clare :) ) had had enough, so we called it a day after the 5th. It was awesome fun though. Back at Blue Lake we had our third big dinner with all 19 of us staying here. Our routine is to have a first sitting for the kids (8 of them), then a second sitting for the 11 adults - it's been really socialiable and fun. Today the menu was leftovers of the 2 previous dinners (mexican and indian). 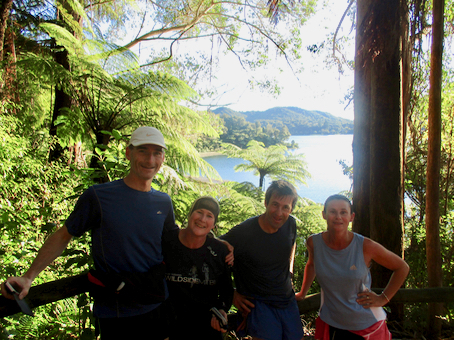 Tomorrow is our last full day in Rotorua and half the group is planning to hit the mountain bike trails (finally! 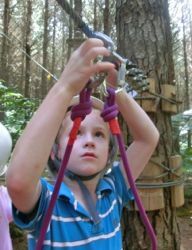 ), whilst the other half, including Zali and Jett are planning to take it a bit easier. 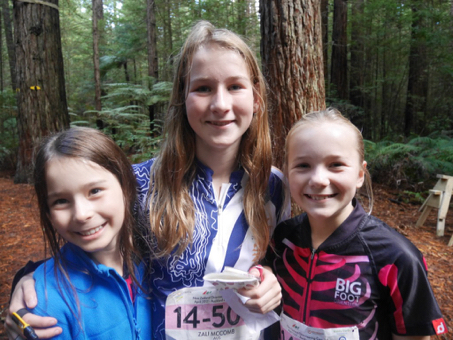 Today was the first of 2 orienteering events in the Rotorua area. The forest used was the mountainbiking/hiking area all around the Redwoods which was super fun but also really difficult in parts. 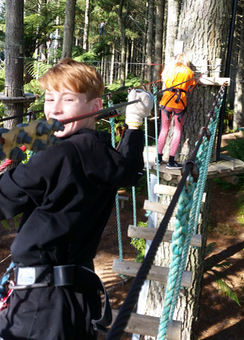 Everyone enjoyed themselves despite making heaps of mistakes. Afterwards we squeezed in an escape room and another luge/gondola session. Fun. Our rest day started with a lovely 6k run around Blue Lake at 7.30 am. The Marsh-Bluetts, Hawthornes, Simpsons and Verde-Thons are all staying out here which is fun. Then we had a delicious breakfast and headed off to Rainbow Mountain Recreation Area. 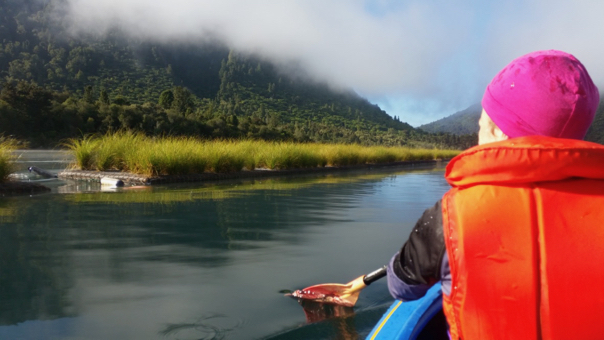 Our plan was to hike to Crater lake, then maybe to the top of Rainbow Mountain, then to go to Kerosine Springs - a completely natural spring area you can walk to and swim in. 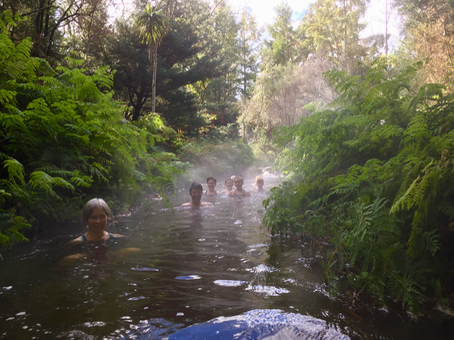 I was resigned for this not to be as good as it sounded, as the photos on the web didn't look that enticing, but I really liked the idea of being able to swim in a natural hot springs so we all packed our bathers and hoped for the best. 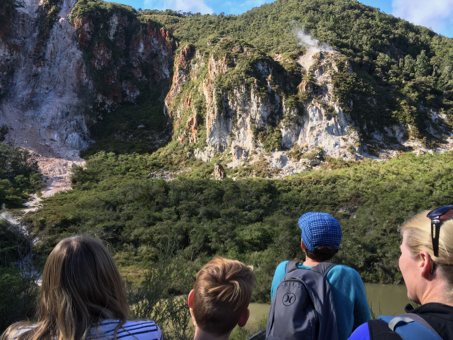 The hike up the mountain was a bit slippery and muddy, but the views were nice - in every direction we looked we could see steam rising up from the ground at seemingly random locations. 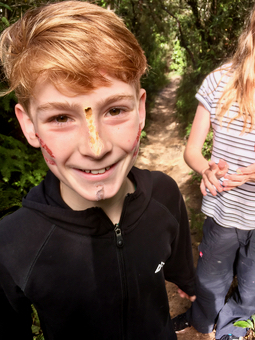 The place is called Rainbow Mountain due to the colours of the rocks which the kids found could be used as great face paints. 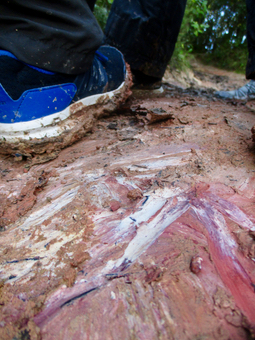 Just looking down into the mud we could see orange, red, white, yellow and even some purple - it was pretty cool. 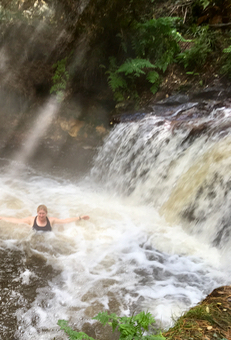 After hiking and sliding back down to bottom we went along to Kerosine springs - a completely natural hot springs area with a waterfall and everything - it was really really awesome. 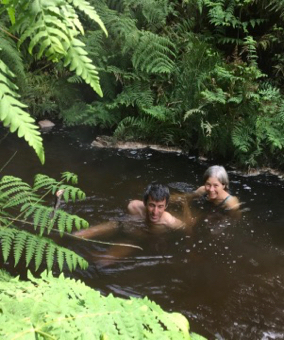 The water was delightfully warm, although, as the name suggests, it did have a slightly kerosiny smell to it! Our long morning meant we had to postpone the luge until another day, much to the dissapointment of the kids who have a wish list of activities a mile long that they are desperate to get through. 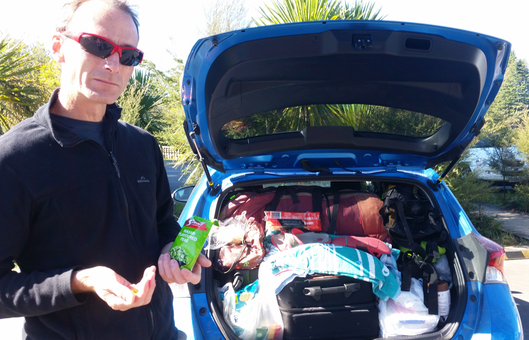 Jon and I don’t normally lose keys very often, but we managed to lose the hire car keys just as we needed to leave Auckland for the orienteering event. An exhaustive search of every packed bag and crook and crevice in our bedroom finally revealed them hidden in the folds of some bedding. By then we were 15 minutes past our planned leaving time which meant Jon's start time was in jeopardy. The drive to the event was about 80 minutes however the organisers had a parking nightmare on their hands due to the massive amounts of rain that had rendered the parking paddock un-usable by non-4wd vehicles. By the time we arrived there was a 40 minute queue as we were directed to park over a kilometre away from the assembly area, which was pretty inconvenient but it could have been worse as we were at least close to the start area. Lots of people were late to their starts as a result of the queueing. By some miracle we did all end making it to our starts on time. Phew. 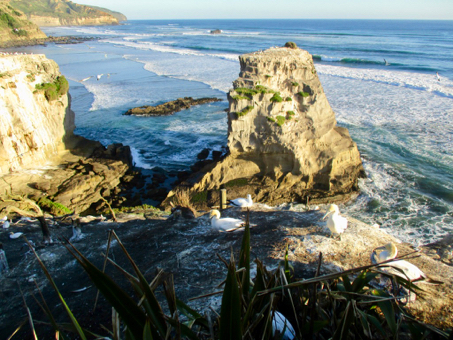 The racing was fun around the limestone cliffs and depressions and we all did pretty well in the standings. 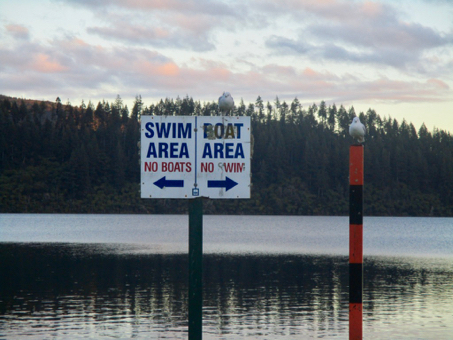 We still had a 3 hour drive on to Rotorua so we left as soon as we could and arrived at lovely Blue Lake around 5pm. Rotorua itself seemed to stink a lot more than last time we were here - it must be affected by wind or rain or something. We’re stink free out here by Blue Lae though! We’ve got a rest day tomorrow so lots on non-resting planned for it of course. Determined to go out with a bang, we had a few fun things lined up for today. Firstly was the last of the repacking (sigh), then a quick easter egg hunt in our motel room. 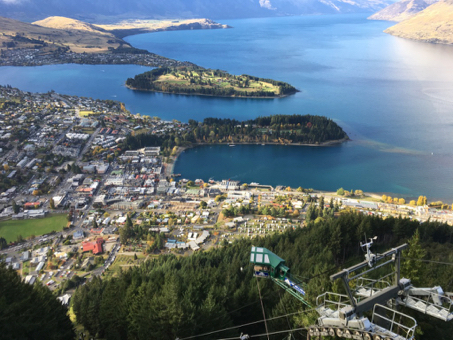 I must mention that both places we stayed in Queenstown were quite expensive, and pretty underwhelming - it was very hard to find much that was reasonably priced particularly as we’ve only stayed 1 night each time. The very small cabin in the caravan park with bunk beds and a double bed in the tiny lounge room was $215, the ‘apartment’ we stayed at for our last night was $164 - but it was really just a slightly battered hotel room with a mini fridge. Anyway - with the easter egg hunt done we headed off to the Gondola, then onto the luge. A quick hot chocolate in the cafe at the top and we were on our way back down the hill and out of town for the much anticipated (or least-anticipated in Zali’s case) Shot-over Jet Boat. It was such a sunny day that it was fun watching the boats zoom up and down the river and enjoying the autumn colours on the trees of the hills nearby until it was our turn in the boats. 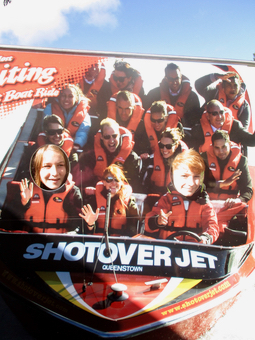 We weren’t allowed to have cameras for this but we re-created the ride quite nicely here.. 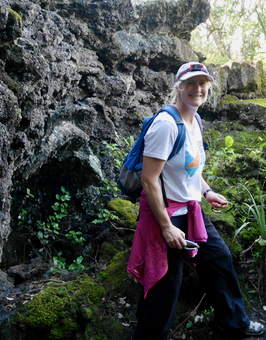 It was really fun - we zoomed through narrow canyons surrounded by autumn trees as well as through the wider parts of the river where the water was only 10cm deep. 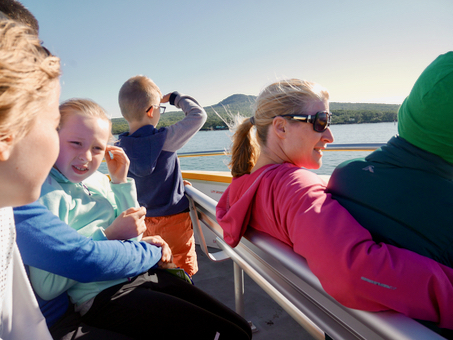 The spins and turns of the boat were like spinning around on a comfy-couch, such is the cushioning effect of the water. You did get sprayed in the face a few times by the wash but it was part of the fun. 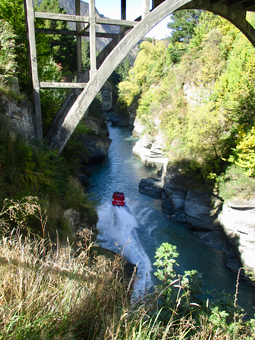 The drivers go deliberately close to the rocks for maximum exhilaration (which was the bit that Zali didn’t like), but I chose to trust the driver completely and not think about all the times that NZ adventure activites have gone wrong :). 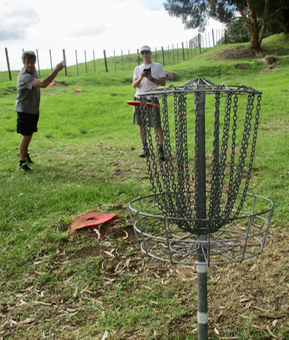 Out of the boat we had time to eat lunch and throw the frisbee in a park before we headed to Queenstown Airport. After an uneventful flight we picked up our hire car and drove straight to Peter and Jane’s place in Kelvin Road. Almost. 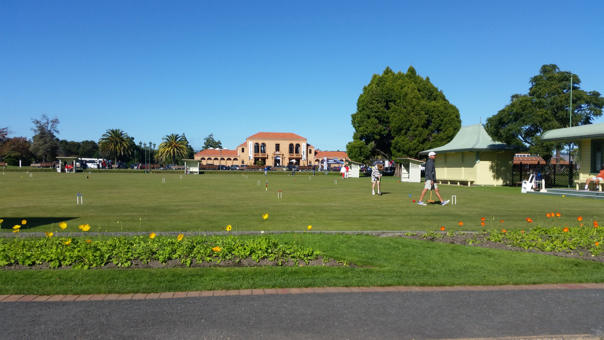 We did drive to Kelvin Road, but I’d selected the wrong suburb, so we drove a lot further south than we needed to. I only realised as we were turning into the fake kelvin road (which was lucky for one of the residents there, as they were saved the inconvenience of having 4 Australians turn up on their doorstep and demand dinner and beds). The correct Kelvin Road was 30 minutes north - including going past the airport again. Uff. Luckily our extended family had decided to wait it out so everyone (bar Peter and Abi) were there when we arrived and we had a great dinner and comfy beds. It was good to see everyone again.